I make additions and corrections to this web site frequently, but because they are buried somewhere on one of the pages the changes are not very noticeable, so I decided to create this blog section to highlight new material. Here below you will find part of one of the pages that I have either changed or added to significantly. The section reproduced here is from my page about Sponsor's marks. A sponsor's mark is a responsibility mark that must be impressed onto gold or silver items before they will accepted at a British assay office for testing and hallmarking. It identifies the person who takes responsibility, a meaning of the term "sponsor", if the item is found to be substandard. The mark is entered into the assay office records by a person who wishes to submit items for hallmarking, along with their details. These are sometimes referred to as "makers marks", but this can be very misleading. It was never the intention that it would identify who actually made the item, which is why the term "sponsor's mark" is preferred today. This is especially so for imported items that were manufactured overseas, which were sent for hallmarking by an agent in Britain, but even in the case of British workers it can be misleading. Take for instance Paul de Lamerie, described as being the "greatest silversmith working in England in the 18th century"; he also subcontracted orders to other London workshops, striking the finished items with his own mark before sending them to be hallmarked. R.W.C.Ltd: Rolex Watch Co. Ltd. This mark "R.W.C.Ltd" in an oval shield, all incuse, is the sponsor's mark of the Rolex Watch Co., entered by Wilsdorf & Davis. For more details about Wilsdorf & Davis and their earlier W&D sponsor's mark, see the entry below about the W&D sponsor's mark. The particular instance of this sponsor's mark shown here is in the case back of an early Rolex Oyster. The R.W.C.Ltd mark is the sponsor's mark, which the case must have if it is to be accepted for hallmarking in a British assay office. The hallmarks below the sponsor's mark are Glasgow Assay Office import hallmarks for nine carat gold for the years 1927 to 1928 - Glasgow date letters were changed on 1 July each year. The name Rolex and the list of patents are manufacturers marks, nothing to do with the hallmarks. There was no problem with manufacturers putting marks and logos like this on a watch case, but the name Rolex could not be officially registered with an assay office as a sponsor's mark because it did not meet the rules of registration, which demanded two or three initials of a principal who would the person responsible if a problem was found. The R.W.C.Ltd for Rolex Watch Co. Ltd. was entered at London on 11 September 1923. It is not known when mark was registered at Glasgow, the records no longer exist. 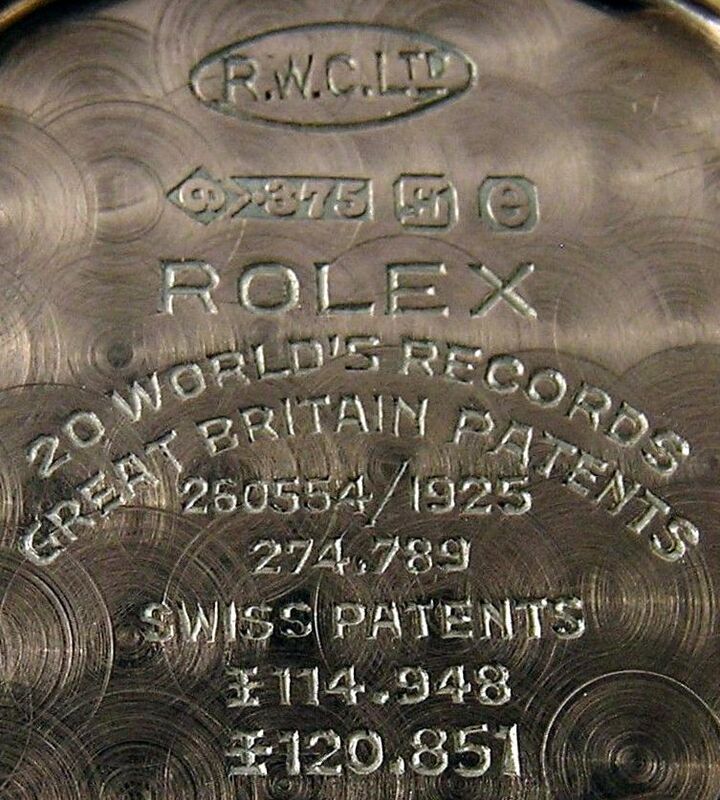 I have seen a Rolex watch with the R.W.C.Ltd sponsor's mark and a Glasgow import mark with the date letter "b" for 1924 to 1925, it would be interesting to know if there were earlier examples. If you look at the section of my Rolex page about the Rolex Oyster case, you will see that I examined a number of early Rolex Oyster cases with Glasgow import hallmarks and with date letters "e" 1927/28 to "o" 1937/38. All of these hallmarks had the sponsor's mark R.W.C.Ltd rather than W&D, showing that by 1927/28 the R.W.C.Ltd sponsor's mark had by then completely replaced the W&D mark. It seems likely that Wilsdorf registered the R.W.C.Ltd sponsor's mark in 1923 as part of his push to get the Rolex name more widely recognised, as he discusses in the Jubilee Vade Mecum, when he was also trying to get British retailers to accept the name Rolex on the dial, alongside or instead of their own. This W&D in an oval shield with points top and bottom is the sponsor's mark of Wilsdorf & Davis, importers of gold and silver wares, first registered at the London Assay Office on 25 June 1907. A second punch with the same mark was registered on 13 August. The company of Wilsdorf & Davis is better known these days by a brand name that Wilsdorf created in 1908; Rolex. The company of Wilsdorf & Davis was founded in London in 1905. Until 1907 they would have imported watches and other silver and gold items without having them tested and hallmarked by a UK assay office, but UK law changed in 1907 and from 1 June 1907 all imported gold and silver items had to be assayed and hallmarked at a UK assay office. This is the reason for the registration of the W&D sponsor's mark. Items imported from Switzerland by Wilsdorf & Davis before 1907 would have carried Swiss hallmarks. Once the UK law was changed, the Swiss authorities allowed items to be exported to the UK without Swiss hallmarks. The registration of the two punches on dates so close together indicates that the second punch was required to keep up with the volume of work, rather than replacing a worn out punch, so Wilsdorf & Davis must have had two men working full time punching watch cases that were to be sent for hallmarking. The following information is gleaned from Culme John Culme "The Directory of Gold and Silversmiths, Jewellers and Allied Traders, 1838-1914: From the London Assay Office Registers" Publication Date: 15 Oct 1987 | ISBN-10: 0907462464 | ISBN-13: 978-0907462460 Two volumes; the first with 4,000 biographies, the second with photographs of 15,000 marks taken directly from the London Assay Office Registers at Goldsmiths' Hall. . The partners in Wilsdorf & Davis were Hans Wilsdorf and Alfred James Davis. The address recorded at the registration of their punches was 83 Hatton Garden, later recorded on 1 November 1907 as moving to 85 Hatton Garden, EC1, then between 17 August 1912 and 25 August 1919 they are recorded at Stevenage House, 40-44 Holborn Viaduct, EC, where they are listed in 1913 as watch manufacturers and importers (TA: 'Wilsdorfs'). Wilsdorf & Davis are also recorded on 8 April 1915 at 15 Northampton Street, Birmingham, and also 3 Ruelle de la Fabrique, Bienne, Switzerland.They are recorded 25 August 1919 as having an office at 61 Rue Elfenau Gare, Bienne, Switzerland, in addition to their London office, and also as representatives of the Rolex Watch Co. Ltd. whose chairman was Hermann Aegler with Hans Wilsdorf and Alfred James Davis as directors and Harry Sedgley as secretary. The same W&D sponsor's mark was entered at Birmingham in June 1909, at Chester in April 1912 and at Glasgow, although records of the date of the latter entry have been lost. These additional registrations allowed Wilsdorf & Davis additional freedom to either order items to be made outside London, or send items to be hallmarked at Birmingham, Chester of Glasgow if there were delays at one of the other assay offices, or if one office was cheaper than the others. Although the sponsor's mark was not necessary on watch cases that did not require a British hallmark, it would have been convenient to arrange for the case maker in Switzerland to stamp the mark as the case was made. There was no reason why it should not have been stamped on watch cases that were not ultimately hallmarked in Britain, and it would have been easier to stamp all cases, whether or not they were destined for Britain. Therefore the W&D mark can be seen in watch cases without British assay office marks. Before 1922 all of Ireland was part of the United Kingdom, and hallmarks struck in any UK assay office were valid throughout the realm. In 1922 the Irish Free State separated from the United Kingdom and formed the republic of Ireland. As a result of this separation, Irish hallmarks were not accepted in the UK after 1923, and UK hallmarks were not accepted in Ireland after 1927. Because of this, watches imported into Britain and hallmarked in Britain, if sent to Ireland, were then also assayed and hallmarked in Dublin. This could of course happen with any British assay office mark, but Glasgow Assay Office hallmarks are the ones most commonly seen alongside Dublin hallmarks. This seems to have happened more with Rolex watches than any other, I don't know why. The picture here shows a Rolex case with Glasgow and Dublin hallmarks. The Glasgow marks are three below the W&D sponsor's mark; the Glasgow Assay Office import mark of two horizontal capital letters "F" facing each other, the Glasgow date letter "f" for 1928/29, and the imported sterling silver standard mark of .925 in an oval. Below these Glasgow marks the Dublin import hallmarks have been squeezed in straight line; the Dublin Assay Office import mark of a boujet or water bucket, the .925 standard mark and the date letter "Q" for 1932/33. 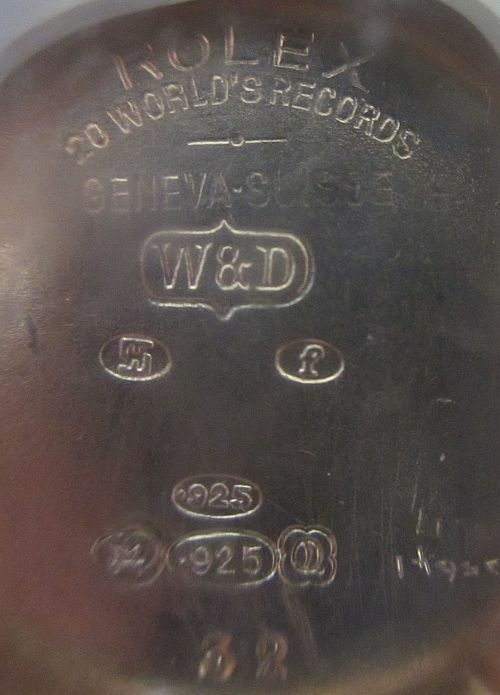 At some point the W&D sponsor's mark was superseded by the mark "R.W.C.Ltd" incuse in an oval shield, also incuse; see the section R.W.C.Ltd above for an example of that mark. The date at which the W&D mark ceased to be used was the choice of the company and is not recorded by the assay offices. The R.W.C.Ltd for Rolex Watch Co. Ltd. was entered at London on 11 September 1923. It is not known when mark was registered at Glasgow, the records no longer exist, but it seems likely that it was registered at Glasgow at about the same time as in London.